But, to John’s point, the main character is a woman set out to study wildlife in an era when women don’t do such things, and she does have some unorthodox ways of solving problems. So it is a bit reminiscent, it’s just that instead of prairie chickens, the wildlife she chooses to study is dragons. This puts dragons in a light that most books don’t. Not as evil treasure hording monsters (think Smaug) or amazing magical beings (think Saphira) but as fascinating and poorly understood, bits of wildlife. Alibeit one that sometimes eats people and has breath with interesting properties, as well as being a severe nuisance to the shepherds. Would I recommend it? 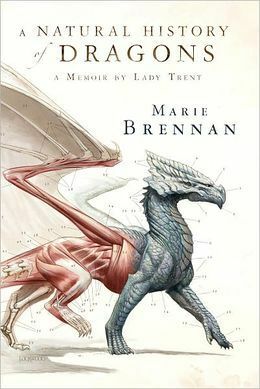 Would I recommend a book with a female character pushing the boundaries, dragons, a mystery and a bit of natural science? In a heartbeat! This entry was posted in book review and tagged book, book review, dragons, fiction, recommended read. I saw that book on the New Releases shelf years ago, and fawned over it, but never actually read it. Clearly, I need to! Ooh sounds like a book we might be able to use for the new Book Twins feature I’m planning. I saw that- sounds like a fun feature both to think of ideas and to find more books to read!